Welcome to the Wikimedia Bookshelf! 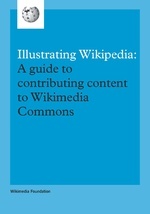 The Bookshelf is a vast collection of high-quality, freely licensed, user-generated informational material about Wikipedia (look below) and its sister projects (see links above). Here are videos, brochures, and other things. Feel free to browse or add your own material. You might even want to join the Bookshelf Project where others like you create more materials. If you want to translate the materials, visit the localization guidelines. This talk introduces Wikidata. It covers what Wikidata is (00:00), how to contribute new data to Wikidata (1:09:34), how to create an entirely new item on Wikidata (1:27:07), how to embed data from Wikidata into pages on other wikis (1:52:54), tools like the Wikidata Game (1:39:20), Article Placeholder (2:01:01), Reasonator (2:54:15) and Mix-and-match (2:57:05), and how to query Wikidata (including SPARQL examples) (starting 2:05:05). See also: PDF of the slides. Macedonian speakers en Прирачник за wiki is a book by Wikipedians Kiril Simeonovski, Zoran Meckarski, Slobodan Jacoski and Dimce Grozdanoski. It is an Instruction manual wirtten in Macedonian. The aim of this work is to help Macedonian civic organizations to start their own wiki site, wiki administration, editing its content, and building the site policy. Albanian speakers en Doracak për wiki is a book by Wikipedians Kiril Simeonovski, Zoran Meckarski, and Slobodan Jacoski. It is an Albanian translation of "Прирачник за wiki" in Macedonian. The aim of this work is to help Macedonian civic organizations to start their own wiki site, wiki administration, editing its content, and building the site policy. This page is a repository for presentations about the Wikimedia projects. The idea is to get inspirations from other people's work, so that if you are preparing a talk yourself, you don't have to do the same work twice. Presentations are organized by language.